BBC Media Player app brings iPlayer to more Android devices | What Hi-Fi? A new BBC Media Player app brings BBC iPlayer to more Android devices, including those which use Jellybean 4.1, such as the Google Nexus 7. After Adobe stopped Flash support for Android 4.0 and above, many devices have been unable to use the iPlayer website. The BBC Media Player provides a neat workaround, using Adobe AIR to play Flash content. This ensures that the iPlayer experience works across all versions of Android, even if you’re running Jellybean. It is available now on Google’s Play Store, separate from the existing iPlayer app. More like a patch than an app, it doesn’t do very much aside on its own but instead opens up when you click on a TV programme on the BBC iPlayer website. 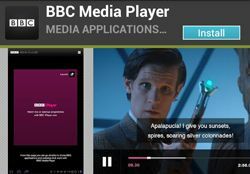 Next week the BBC will release an updated Android iPlayer app, which will incorporate much of the technology used in this Media Player. So far there has been no word on an Android version of Mobile Downloads, which allows you to download iPlayer programmes on iOS devices.